It’s becoming harder for urban-dwelling Texans to find an affordable home to buy or decent place to rent as house prices outpace salaries, the income gap between renters and owners continues to widen and the number of high-poverty neighborhoods increases. Unemployment rates and downward spirals in home values weren’t nearly as bad in Texas during the national economic downturn as they were in other parts of the country. But the state’s large urban areas are still experiencing similar mismatches between housing stock and income as other American metropolitan areas. Harvard researchers, elected Texas officials and development industry experts point to a number of reasons for the lack of affordable housing. They say that everything from stricter financing requirements to government regulations and labor shortages can drive project costs up to the point where smaller homes and rental properties for low-income people aren’t cost effective to build. “Conditions are particularly tight at the lower end of the market, likely reflecting both the slower price recovery in this segment and the fact that fewer entry-level homes are being built,” the Harvard report said. High demand for properties in Texas — a side effect of the state’s relative economic success and continued population growth — is also a contributing factor to increased project costs that typically get passed on to home buyers or renters. “Land costs in rapidly growing or hot markets is always a big driver,” said Scott Norman, executive director of the Texas Association of Builders. Meanwhile, more than 2 million urban Texan households, most of them renters, are considered financially burdened by housing costs because they spend 30 percent or more of their income on housing — and more than 950,000 of them spend more than half of their income on housing costs. Experts and a litany of academic studies say that Americans who spend that much of their income to keep a roof over their heads have a harder time climbing out of poverty or moving up the socioeconomic ladder. “There are so many other budgetary pressures, and the more you spend on housing, the less you can spend in other areas that impact your family’s ability to succeed,” said Mandy DeMayo, executive director of the housing advocacy group HousingWorks Austin. The report and data were released on the heels of a legislative session that some city officials and lawmakers said further hamstrung attempts to create more affordable housing — especially for the state's poorest residents. And they were released one day after Gov. Greg Abbott vetoed a bill from State Rep. Eddie Rodriguez that was designed to keep in place districts that protect the affordability of houses in parts of gentrifying Austin. "Directing large amounts of property tax revenue to select city projects has the effect of increasing the tax burden on other property owners," Abbott wrote in a proclamation explaining the veto of House Bill 3281. "We should not empower cities to spend taxpayer money in a futile effort to hold back the free market." Rodriguez lambasted the veto and accused Abbott, a Republican, of hurting residents as part of state leaders' ongoing attempts to pre-empt local officials' governance of their cities. “There is a real affordability crisis in my district, and the governor’s cruel veto will hurt hardworking Texans who rely on their government to work for them," Rodriguez said in a statement Thursday. According to the Tribune’s review of data Harvard collected, median Texas house prices outpaced median incomes in all five of the state’s major metro areas from 1990 to 2016. In Austin, that gap is most pronounced. That means it’s harder for a resident there to find a house to buy than it is in the state’s other large urban areas. DeMayo said demand is keeping land prices high. Compound that with increased labor and construction costs and the price to build ends up getting rolled into monthly mortgages that remain out of reach for many. “Some of that is land economics, which I wish I had the answer to,” she said. Austin Mayor Steve Adler said prices will continue to rise until the city and real estate industry figure out ways to provide more housing. He said the city wanted to talk to developers about creating a program where development fees would be set aside and used to build affordable housing units. But the Legislature passed a bill forbidding such programs during their recent regular session. "The state cut off the conversation even before it could begin," he said. The Harvard study found that low-income Americans are having particular trouble finding affordable apartments to rent or houses for which they can secure a mortgage. 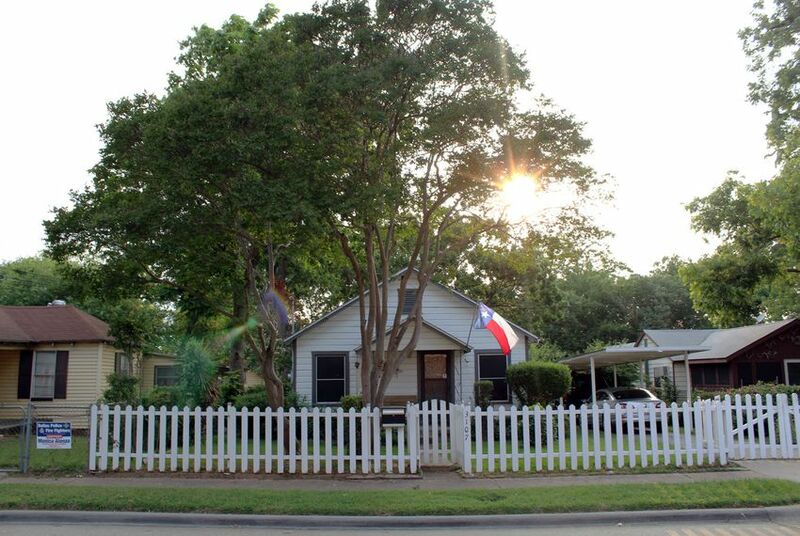 The Austin area had the smallest percentage of homeowners and renters — 59 percent and 40 percent, respectively — able to afford the monthly payments of a median priced home. El Paso was the only major Texas urban area where more than half of renters were able to afford such monthly payments. Meanwhile, the income gap between renters and homeowners was most pronounced in Houston, where a typical renter’s income of $39,500 was 64 percent of a typical homeowner’s income of $61,470. Veon McReynolds is a Houston housing advocate and president of the board of the Texas Low Income Housing Information Service. He said it is frequently difficult for renters to become owners — a key way Americans build personal wealth — because minimum wage is no longer enough to cover the costs of buying a home. “I have to be making three times minimum wage to maybe be able to save just a little bit of money,” McReynolds said. He said if minimum wage isn’t increased, there will continue to be high demand for subsidized housing. “The opportunity is not there,” he said. The state’s poorest residents — those making under $30,000 a year — are far more likely to be considered financially burdened by housing costs. But even those making $50,000 and $60,000 can have a hard time finding an affordable place to live. Residents who make less than $30,000 a year in the Austin, Dallas-Fort Worth, Houston and San Antonio areas are more likely to spend more than 30 percent on housing costs than typical Americans earning the same salaries. In Austin, Dallas-Fort Worth and Houston, that’s also true for people who make between $30,000 and $44,999. Austin is the only Texas urban area where people who earn between $45,000 and $74,999 per year are more likely to be burdened by housing costs than a typical American in the same income bracket. Harvard researchers point to a growing number of high-end housing units and decreasing number of low-cost units as a major culprit. And state Rep. Eric Johnson, D-Dallas, said gentrification is only making that situation worse. His district covers part of West Dallas, which has become the epicenter of that city’s mounting affordable housing crisis in the past year. A new signature downtown Dallas bridge has attracted new businesses to the aging and low-income neighborhood, which in turn has lured new residents to high-end apartment complexes and townhouses that are replacing some low-cost properties and driving up the rents and property taxes on homes that remain. “So much that’s occurring in those areas is leading to the destruction or the elimination of affordable housing where it already exists,” he said. Data reviewed by the Tribune found that Dallas-Fort Worth between 2000 and 2015 saw the biggest increase — more than 1 million people — in the number of residents living in high concentrations of poverty. Those are neighborhoods where at least 20 percent of residents live below the federal poverty threshold. At least one-fifth of residents there and in the Austin, Houston and San Antonio areas now live in concentrated poverty. More than half of El Paso area residents do, though the share of residents in such high levels of poverty there and in the San Antonio region declined during the 15-year period. Experts say that it is more difficult for people to move up the socio-economic ladder when they live in concentrated poverty. DeMayo, the Austin housing advocate, said that studies show that living in more affluent neighborhoods or areas with more socioeconomic diversity helps improves people’s job prospects, quality of life, health care access and educational opportunities. She said people in Austin often assume their city is the only one experiencing rapid growth and dramatically increased housing prices. But, DeMayo said, a lack of affordable housing is becoming common across America, something the Harvard report echoed. “It’s all at a different scale, but these are growing cities and these are challenges we’re all facing together and nobody has the answer yet,” she said. Disclosure: The Texas Association of Builders and Steve Adler, a former Texas Tribune board chairman, have been financial supporters of The Texas Tribune. A complete list of Tribune donors and sponsors is available here.